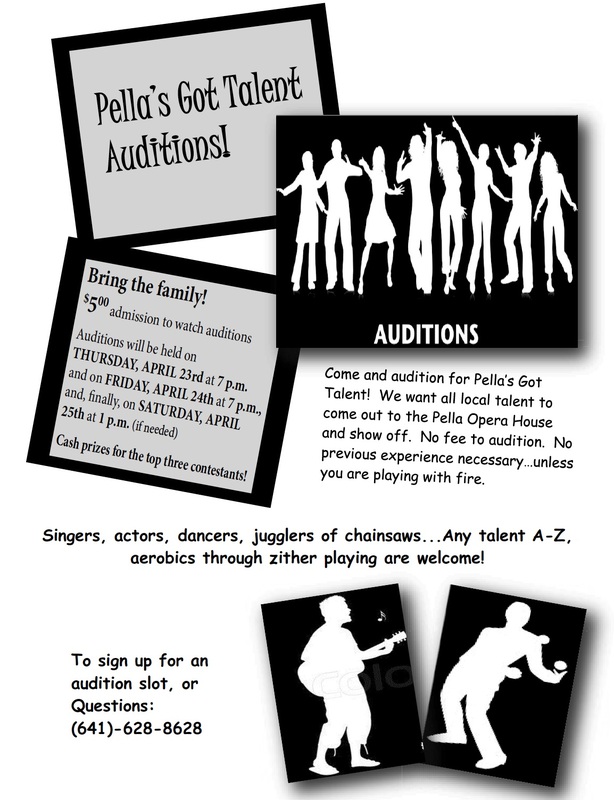 Pella’s Got Talent Auditions April 23 & 24 @ 7 p.m.
Pella’s Got Talent Auditions – April 23rd and 24th, 7 p.m.
For the second year in a row, we are inviting all local talent to come to the Opera House and sing, dance, act, and share whatever their talent(s) might be. Everything from A to Z, from acrobatics to zither playing, is eligible. To sign up for your audition slot, or to ask any questions, please call 641-628-8628 as soon as possible. No experience is necessary! This is a fun event, and we do our best to help everyone have a great time at auditions! Ten finalists will be selected to perform at the May 16th finals. The top three finalists will be awarded cash prizes $250 (first place), $100 (second place) and $50 (third place).